ASU Gammage announced today that the Tony Award-winning musical "Dear Evan Hansen" set a new record for fastest sellout of a show at the historic Frank Lloyd Wright theater by selling out of all available tickets during the show’s fan presale, leaving no tickets for the general public onsale. "Dear Evan Hansen" will have a lottery in conjunction with the show’s run Nov. 27 to Dec. 2. Details will be announced closer to the engagement. "Dear Evan Hansen" was due to go on sale at at 10 a.m. Monday, Sept. 10 along with "Disney's Aladdin," "Hello, Dolly!" starring Betty Buckley, "The Book of Mormon," "On Your Feet," "The Play That Goes Wrong," "Rent," and "Roald Dahl's Charlie and the Chocolate Factory." The winner of six 2017 Tony Awards, including best musical, "Dear Evan Hansen" features a book by Tony Award-winner Steven Levenson, a score by Grammy-, Tony- and Academy Award-winners Benj Pasek and Justin Paul ("La La Land," "The Greatest Showman"), and direction by four-time Tony Award nominee Michael Greif ("Rent," "Next to Normal"). 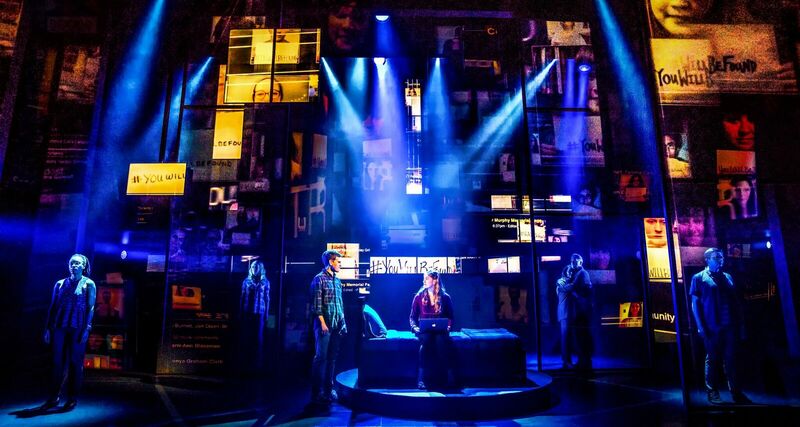 Declared “one of the most remarkable shows in musical theater history” by the Washington Post’s Peter Marks, "Dear Evan Hansen" opened at the Music Box Theatre to rave reviews on Dec. 4, 2016, where it’s broken all box office records and struck a chord with critics and audiences alike. In addition to winning six Tony awards, "Dear Evan Hansen" has won numerous other awards, including the 2017 Drama League Award for outstanding musical production and for the off-Broadway production, two Obie Awards, a Drama Desk Award, and two Outer Critics Circle Awards and two Helen Hayes Awards. The show’s original cast recently won a Daytime Emmy Award for best musical performance on a daytime talk show for their April 2017 performance of “You Will Be Found” on NBC’s “Today Show,” only the second Broadway show in history to win that category. The Grammy Award-winning original broadway cast recording of "Dear Evan Hansen," produced by Atlantic Records, was released in February 2017, making an extraordinary debut on the Billboard 200 and entering the chart at No. 8 — the highest charting debut position for an original cast album since 1961 — and went on to win the 2018 Grammy Award for best musical theater album. A special edition coffee table book authored by Levenson, Pasek and Paul, "Dear Evan Hansen: Through the Window" (Grand Central Publishing/Melcher) is now available, offering an in-depth, all-access look at the musical, including never-before-seen production photos and cast portraits, behind-the-scenes stories, and a fully annotated script by the authors. In addition to the touring production and the record-breaking Broadway production, "Dear Evan Hansen" will launch its first international production in Canada in March 2019 at Toronto’s Royal Alexandra Theatre. For more information, visit DearEvanHansen.com. Getting into college is a huge achievement for some students, but staying the course can be even more difficult. Arizona State University is making big strides in its efforts to keep students in school, and the numbers bear that out. ASU’s freshman retention rate has hit 85.2 percent in the latest data available, higher than the nationwide average and nearly 11 percentage points higher than 15 years ago. ASU leads the state’s public universities: For the same year’s cohort, the rate at the University of Arizona was 83.3 percent; it was 75.8 percent at Northern Arizona University. For in-state freshmen, ASU’s retention rate was 88 percent — nearly 15 percentage points more than in 2002. This means that more freshmenThese figures are for freshmen who started in fall 2016, the latest finalized data available. who start at ASU are coming back for their sophomore year — an important marker for eventually earning a college degree. The retention rates are also improving for low-income and first-generation students. In 2007, 78 percent of freshmen who received Pell grants or who were the first in their family to attend college came back for their sophomore year. That figure improved to 83 percent for the 2016 cohort. And, in that same time period, the number of low-income and first-generation students at ASU more than doubled. Overall, for “A” students (those who had a high school grade-point average of 3.67-4.0), the retention rate was 93 percent. For “B” students (high school GPA of 2.67–3.66), it was 81.6 percent. The university has a goal of reaching an overall 90 percent retention rate by 2020. And students aren’t just sticking around — they’re thriving. ASU had a banner year in 2017-18: Not only did more students get into high-status programs, they won awards that had never gone to Sun Devils before. The university also remained one of the top producers of Fulbright student winners, ranking seventh among public institutions for sending students abroad in the prestigious program. The effort to make sure students persist in their studies is university-wide, according to Provost Mark Searle. ASU has worked to keep freshmen engaged and successful in a variety of ways, including innovative teaching methods and one-on-one coachingThere is also an initiative called Game Changers, specifically for first-generation freshmen. Besides coaching, these students get one-on-one counseling from older peer coaches, many of whom also are first-generation students, along with group events and advice on building practical skills, like time management.. The university also has harnessed big data to power an “early-alert” system that finds students at risk of dropping out. They then get immediate help, whether with academics, financial aid or counseling. Essentially, the university has pinpointed what students need, and then it helps them get it immediately. “If you feel that people around you have your back, you’re more likely to overcome barriers. If nobody has your back, small barriers will turn into big ones,” he said. The tens of thousands of students at ASU generate a sea of data, and now the university is analyzing it in strategic ways to pinpoint students who might not be on track academically and to create personalized interventions. Among the ways ASU is working on retention is with Civitas, a platform that allows the university to detect signs in real time that a student is becoming less engaged, according to Frederick Corey, vice provost for undergraduate education. “We’re using data to make more informed decisions about how we advocate for student success. We’ve always used big data sets, but now we’re using them more strategically,” he said. “We’re interested in sudden changes, because that’s an alert,” Corey said. Class attendance is one variable, but the system is even more nuanced. “For example, Civitas will read activity in Blackboard — logging in, participating in discussions, and it measures the participation of a student relative to other students in that section. “So if a student suddenly stops participating, it would create a change in the persistence outlook” and trigger an alert, he said. Then the appropriate person would contact the student — such as the professor, academic adviser, success coach or a financial aid adviser. The point is to fix problems before they escalate, said Arthur Blakemore, vice provost for student success. “Just waiting for a student to not enroll is too late,” he said. Technology also is connecting students to each other through the GetSet mobile app, which links students who have questions to their peers. The platform was recently incorporated into the ASU 101 freshman seminar. The app also will send alerts for important dates, like class registration or financial aid sign-up. Academic performance is another key to sticking it out. Students who earn a GPA of 2.5 or lower in their first semester are at increased risk of not returning. So ASU has changed the way some students take their “gateway” courses, such as college algebra, which previously had high failure rates, Blakemore said. Several first-year courses, including algebra, introductory biology and physics, are taught online through an adaptive-learning model, in which students learn small chunks of content at a time, being tested for mastery before moving onto the next lesson. Besides the online content, students attend class to do hands-on work solving problems. Students are learning the content better in this model, which is replacing passive learning in a large-lecture format. Crucially, the adaptive-learning classes allow students who start with low test scores to bypass remedial classes — another reason students drop out. Students must pay for remedial classes, which don’t award any credit and put students behind. The new model allows them to get extra help specifically on the concepts they need. Another program for students who need an academic boost is LEAD, which stands for “Learn, Explore, Advance, Design” and is a project-based curriculum. Low-income and first-generation students who completed LEAD had an average first-semester GPA of 2.9 compared with matched peers who were not in LEAD with a GPA of 2.48. Analytics can identify problems in a student’s data, but a personal coach can look into the eyes of a teenager and see that something is wrong. ASU nurtures freshmen through the First-Year Success Center, which offers peer-to-peer coaching. Nik Santiago did not have a great first semester at ASU. “The biggest thing that kept me from really feeling at home was the fact that I was a commuter student,” he said. “So in my classes I would see people who were really close friends even during the first week and I realized that they probably lived on the same floor. He decided to respond to an email invitation from his first-year success coach. “I saw that I could have someone to talk to, an upperclassman who’s been there before,” Santiago said. So Santiago, who graduated in May with a degree in digital culture, became a first-year success coach himself, guiding other freshmen who are trying to figure it out. He has learned how to draw out a teenager. Dedicating a 30-minute session to a freshman makes a big difference, he said. The coaches guide the freshmen toward help with academics and financial aid, but social issues are a major concern for many, according to Rachel Tomlinson, who served as a success coach during the 2017–18 school year. “We do have lot of students who had a fight with their best friend, or they’re not going to the same campus, or that long-distance relationship isn’t really working out. So it’s trying to see how you can make ASU feel more like a home to them,” said Tomlinson, a graduate student in the Master of Legal Studies program. She also struggled during her freshman year when she was rethinking her initial choice of major. “I got to my classes and I was like, ‘Nope, engineering is not it,” she said. She eventually changed majors and switched to the Downtown Phoenix campus, which started a snowball effect. “I was surrounded by people who were interested in health and policy and those helping professions,” she said. The First-Year Success Center looks for coaches like Santiago and Tomlinson, according to Kevin Correa, director of the center. For some students, freshman year can be a challenging, sometimes overwhelming experience. Faculty and staff at ASU are empowered to create a supportive environment for students, where they feel validated, Krasnow said. His staff works with every academic college on training. For example, advisers are trained to look for behavioral signals that could signal anxiety or depression, he said. They do that by asking about sleep, and by talking about their sleep patterns, students often will reveal their underlying worries. Students can visit the counseling center to talk about any issue at any time, Krasnow said. The center surveys the students it helps, and most report that what they’re experiencing is interfering with their academics, he said. They also report that getting services makes it more likely that they’ll return. Learn more about the First-Year Success Center and ASU Counseling Services.